The deep rich shade of Aubergine is a new color for 2006. The Fenton chemist developed a special formula to go beyond Violet into deep Amethyst. 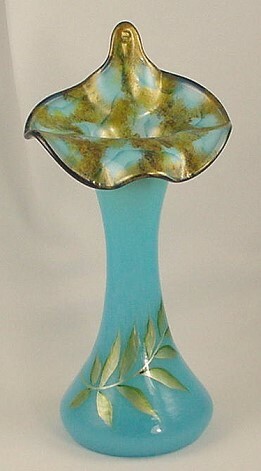 Designer Kim Barley employed an innovative stippled brush technique to blend colors in creating this distinctive decoration for a tulip vase, or Jack-in-the-Pulpit vase, in the new Sky Blue color. Kim's artistry replicates the look of hewn stone, and a leafy branch encircles the base.